Dee Careathers introduces herself to the East Lansing Hannah Community Center Committee as Tim McCaffrey watches. In six months, the future of The Hannah Community Center will be clearer. The former East Lansing High School will face its future in the form of a plan. The Hannah Community Center located at 819 Abbot Road has been facing trouble with finances and infrastructure. Since 2002, there have been no renovations according to Tim McCaffrey, director of the city’s Parks, Recreation & Arts Department. Needed renovations are roof maintenance, third floor usage and improvements to the theater. “Before we make investments, we need to revisit possible uses and proper upgrades to the third floor,” said City Council committee liaison Shanna Draheim. The third floor hasn’t been occupied since 2002 when Hannah opened as the community center. Currently, it is a space for storage, however the committee will consider proper use of the space. With a budget crisis in 2018, the city discussed closing the center. The center is home to various activities such as weekly church services, open community basketball, the Prime Time Seniors’ Program, an art gallery and more. City Council created the committee to prepare for improvements through committee recommendations and community feedback. “The committee consists of city committee members from boards relevant to the community center and members of the community with expertise,” said Draheim. Committee members come from Parks, Recreation & Arts, Planning, Arts and the Seniors’ Commission. The committee is short-term, expected to run six months until late Sept. 2019. Meetings will be once a month on Mondays at 6:30 p.m. in the Hannah Community Center Ballroom. Each meeting will include a presentation by a staff member. 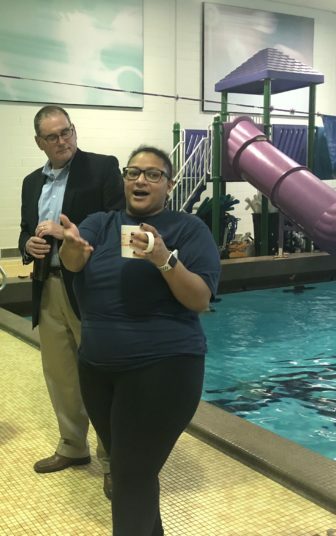 The first meeting was held March 25 and included a tour of the Hannah Community Center and a brief introduction of the purpose of the committee. The next meeting will occur April 22 and will cover committee goals and objectives.